Elaine says ... Hi, just a quick note to let you know how Freddie is doing after you removed his blind wolf teeth. We started him in work a week after and he has made a lot of improvement. He doesn't grab the bit as he did before and is improving all the time. This is helping with his concentration and my daughter is finding him so much easier to ride - so smiles all round! Many thanks for your expertise and "no fuss" approach which made it stress free for Freddie. (He was grazing after one hour). Caroline says .... Sorry it has taken a while for me to get back to you, but I have been having so much fun with my totally different horse! Since having her teeth done Pearl is lot more relaxed in her work. We are now able to work without her bearing down on the contact and she has totally loosened up on the left rein. I can feel such a difference. I have actually been able to put her back in a loose ring french link snaffle instead of the hanging cheek and she is just so responsive. The tension has melted away and our schooling sessions are improving every time. My instructor was amazed at the change in her attitude and freedom of movement. Thank you so much for helping me get a happy horse. I just wish I had called you sooner for Pearls sake. Thank you again. Wendy says ... Just wanted to 'bore' you with some recent pics of Tilly, it's about 3 months since you came and did her teeth and she's doing so much better now she's not in pain, I'm having to keep her on restricted grazing so she doesn't get too fat - she can now happily eat most things including carrots! From Sue, Todmorden ... First of all I must apologise for not sending this email earlier. I don’t know if you remember but you came out to my cob and warm blood youngster back in January, pug and caspa in Todmorden on a VERY cold day!! You asked me to let you know how they were after treatment and that is why I apologise for not letting you know sooner. The biggest difference is my youngster, Caspa, what can I say chalk and cheese!! I had problems when mounting him as he wouldn’t stand when I gathered up the reins, not now good boy stands patiently while I get on board. He used to practically sit down when I ask him to wait before moving off, not now!! On rides he would suddenly threaten to rear with me, not now!!! And the contact is firmer, steadier and he is working without diving behind the bit, taking me forward. Prior to your visit I had a youngster who I thought was a VERY naughty boy and I was considering selling him but now he’s a changed character I would never had believed having his teeth done by you would have made such a difference particularly as I had them done every 6 months since I bought him by the vet but I was willing to try anything. I can’t thank you enough and I have recommended you to all my friends. I’ve left a message for Madeline to book me in again for Sept so look forward to seeing you again then. From Nicky, Knaresborough ...Thank you so much for sorting Vino’s teeth for me last Sunday. He has been a different horse since and even won one big qualifier yesterday, Thanks again. From Kate, Halifax ... I was delighted with Sally’s first visit to me this morning. My cob Meece is 14 3 but a big boy whom, from previous experience, I fully expected Sally to sedate, if we and my 6 foot 4 inch husband weren’t to be towed all round the stable. But Sally found him a pussycat –it’s the first time he hasn’t needed sedation. From the moment she put the gag in, he was really well behaved for her, as was my Welsh section D. So the horses had a good experience and I am very pleased..
From Sue, Sinnginton ...I assumed that my Oberon mare was just not a happy character. She was very spooky, which made her very hard to school. She wouldn’t take a contact. Prior to Sally’s visit, every other dentist but one missed the fact that she had a supernumary tooth, and even that one didn’t treat this. Sally told me that she needed power work to tackle the problem properly. I thought I’d been doing everything right, but as soon as Sally did the proper job, Mo became generally much less nervous, calmer and a happier horse altogether. We noticed that she also stopped quidding. She had been slowly progressing, but Sally’s work greatly accelerated the process. Mo’s way of going improved dramatically – she now accepts the bit much more and I can start more serious schooling. Sally also suggested I massage the TMJ area by her eyes, which she loves. I would say that she is almost a different horse. From Sandra, Driffield ...Sally has transformed Murphy, my daughter’s pure bred Connemara. Since her treatment the pair were picked for the England 3A dressage team national championships for Mountain and Moorlands. Murphy won an individual sixth out of 30 and the class team won. Before Sally came, nobody seemed to get to the back of his mouth and sort out the huge hooks he developed. After Sally had been, Murphy’s whole shape changed. He came round and worked down the bridle. We’re so chuffed. 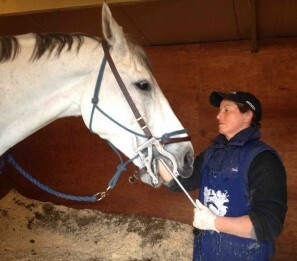 From Alex ... Hi Sally my pony’s going really well after teeth been done again. Big improvement in Jenny’s horse. See you soon. From Hannah ... Odwig is improving daily. Gone fab today and had froth in mouth which is good. From Laura ... Thanks so much for Mos’ teeth last week. He seems more relaxed in the mouth since. From Diane, Bradford ... Dartie’s teeth were horrendous when he came to us. He used to bare his teeth when ridden, and shake his head a lot. I can’t think how he put up with them for 12 years! He’d been in a show yard at one time, and never quite performed as well as they thought he should, with Olympic champion Langfield Ross as his sire. I can quite see why: I could have cried when Sally got me to feel his teeth: it was like running your hand down a mountain range, and they were sharp too, with hooks at the back. He had no sideways jaw movement and at the back his jaw was completely locked. Sally said she couldn’t put him right all in one treatment, but I’d say he’s gone from 15% ok in the mouth to at least 85 per cent. After Sally had been, he was like a reformed character and so much happier. He did so well with my eight-year-old daughter in the autumn shows and ended up Reserve Champion. My purebred Arab Ras was really having problems eating, he was loosing weight and I really was at my wits end, He had already had dental treatment and I was told he was All sorted for 12 months a few weeks went by and the poor thing still was struggling to eat his haylage, I tried every different haylage bale in the area, I also soaked it but still no different, until I was recommended to sally kingsley and wow what a transformation. When Sally looked into his mouth He was in a terrible mess, he had severe perio disease the smell was awful, he needed a lot of drilling to make him as comfy as possible, sally told me his mouth was a mess and no wonder he had lost weight, his gums were red roar and food was trapped in the cracks in-between the teeth. When she pulled it out it was very smelly and bleeding it looked horrendous. With sally’s expertise she worked on his mouth for about an hour and did she do a fantastic job, He was sore for a week or so but like she said he will be uncomfortable until his teeth settles and was she right it took a good few weeks before he started eating haylage again and I have never looked back. I treated his mouth with mouth wash for the perio and I hosed his mouth three times a day as recommended by sally, he has had a second treatment from sally and she was amazed how he has improved her words were’ its like looking into another horses mouth’. Ras went on to compete at horse of the year show were we achieved an amazing 6th place, a outstanding award and I do believe sally has saved my horses mouth, we both have never looked back. Thank you Sally for all your help, I feel I was very lucky meeting you. Just wanted to let you know, Helen and I have just got home from Whittington Point to Point races where Parisienne Gale ran in Div 1 of the 5,6,and 7yo maiden. She just went off in front with Sue Sharret on board, jumped like a stag and was never headed. As you can imagine we are completely overjoyed, and have absolutely no doubt that the work you did has had a major effect on her wellbeing. Thank you for attending to our horses last week. All mine are better to the contact but the very best is Rhiannon's 'spotty thing' Monty. He is no longer having panicky moments when he is in pain because of the wolf tooth and he is much more settled on the bit and jumping more confidently. Leo is doing absolutely fine, thank you. This morning he munched through his net like he had been starved! I havent ridden him yet as the weather over here is pretty windy and wet. If the weather improves i'll ride later. He is out in the field with his mates at the moment.